With numerous different types and formats available, infographics provide ample space for creativity and analysis for brands, both in the kinds of information they capture and in their approach. For customers, the form helps them quickly visualize complex issues. Together, that’s a recipe for engagement and messaging, making creative visualizations an ideal marketing format. Here’s a deeper look at the kinds of approaches the most successful brands are taking for a lesson or two in how to get infographics right. Designed by mycleveragency using data collected by Brandwatch, the data visualization above entitled “Language on the Internet” explores a topic that’s of interest to just about anyone with a Twitter account: how social media is changing the way we speak. In visualizing these stats, both Brandwatch and Mycleveragency can reach a broad base of people who are inherently interested in this subject and are highly likely to engage in sharing (I mean, who wouldn’t want to know what all those LOLs and ROTFLs mean for humanity?). The precision of the stats chosen and the logical, seamless layout and flow of the infographic help establish both brands as marketing and design authorities — go-to experts for anyone looking to market their brand or just learn a little bit more about marketing best practices. In this way, the engaging choice of topic and design help to expand the reach of both agencies, while the excellent research and communication that undergird the project establish both companies as niche authorities not to be ignored by the industry. That’s the best of two worlds, in one infographic. If you’re a music fan of any stripe (so, if you’re human), you’ve probably wondered how we’ve moved from gospel music to grunge. 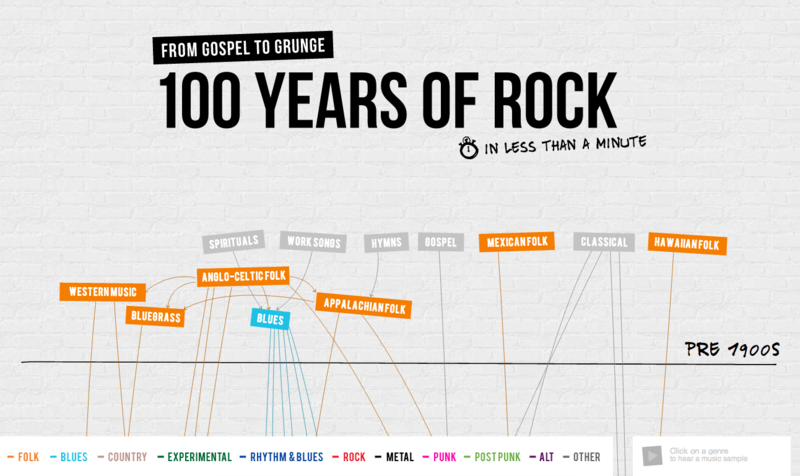 oncertHotels, a booking service that helps you find rooms near events, capitalizes on this curiosity in the above infographic, “100 Years of Rock”, which helps viewers visualize the timeline of rock in less than a minute. Though it doesn’t directly discuss what ConcertHotels does, it stays within the brand ecosystem, which is built on a passion for music. And because the timeline also provides samples of music, the infographic provides a fully interactive experience in a single interface for a totally dynamic experience, ensuring the infographic will be well-shared. That’s sure to sell a lot of rooms (and maybe some MP3s) in the long term. One of the most popular forms of content on the internet falls into the “how to” genre, and the guide or process infographic is no exception. This shouldn’t come as a surprise, as it reflects the shift from passive to active media consumption; viewers want their content to help them create or learn, not to pitch to them. 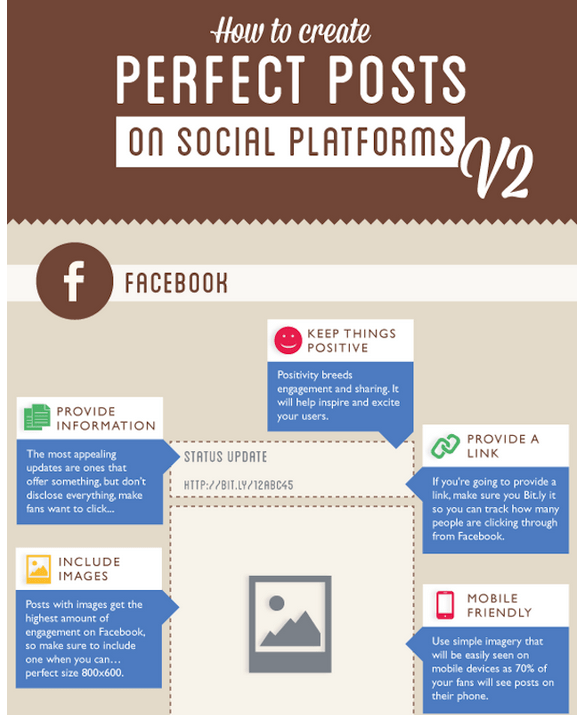 In “How to Create Perfect Posts on Social Platforms”, mycleveragency again takes a very popular yet mystifying subject and breaks it down in a step by step, highly-visual manner that makes it easy for just about anyone to follow. In doing so, the infographic reinforces the brand’s influence as a social media expert, ready to help both novice and advanced users, both of whom are more likely to develop brand loyalty thanks to this helping hand. 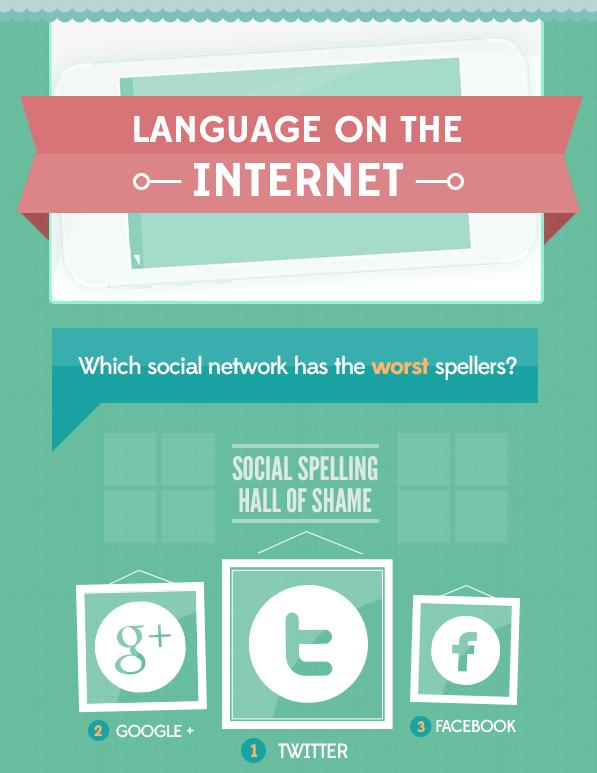 Again, the infographic is inherently shareable, especially in niche social media groups, and it’s sure to get followers engaged. London may be one of the world’s great shopping capitals of the world, but few working people have the time or energy to expend on dashing all about the city to find that perfect gift. 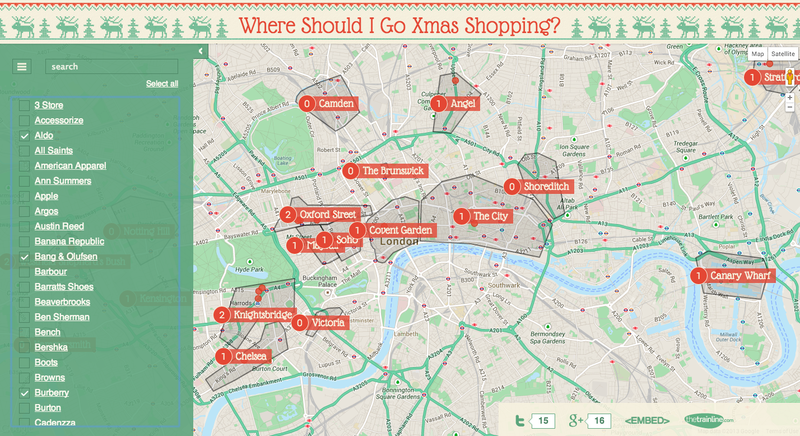 Online shopping is one solution; using this interactive map entitled, “Where Should I Go Shopping in London?” is another. Just click the stores you’d like to visit on the sidebar and they’ll automatically populate on the map so that you can head to the areas with the densest concentration of your target shops. For the company that produced this infographic, Trainline, which helps customers find the best tickets and routes for their travels, this kind of route planning is well within their area of expertise, and just goes to prove so even further. The Christmas angle makes the infographic timely, relevant and helpful. It’s highly likely that consumers would take this map with them on their shopping adventures, meaning the brand’s messaging will be in the palm of their hand wherever they go. Note that there are many other effective ways to use maps to illustrate important points. Maps, just like infographics themselves, are a powerful tool for instantly capturing an important point that’s directly relevant to the people who care about the regions pictured. There are few things people like quite so much as taking quizzes that reveal something about themselves. All the better if doing so involves a healthy dose of childhood. That’s something Two Little Fleas embraces wholeheartedly with the above “90s Nostalgia Quiz”. The infographic is bound to be a hit with (you guessed it), a wide audience of ’90s kids who will definitely want to interact with the quiz and share their results on Facebook. That does a lot for the Two Little Fleas brand, as it brings more and more visitors to their site, where they’ll find even more quizzes and other fun games, recipes and quotes with which to engage. The quiz is a quick, easy way to move potential consumers deeper into the brand. From hard hitting research to goofy quizzes, there are just about as many ways to approach an infographic as you can imagine. But whatever your approach, an infographic is the perfect way to expand your viewership while still satisfying your diehard fans, establishing your authority and reinstating your authority within your niche.